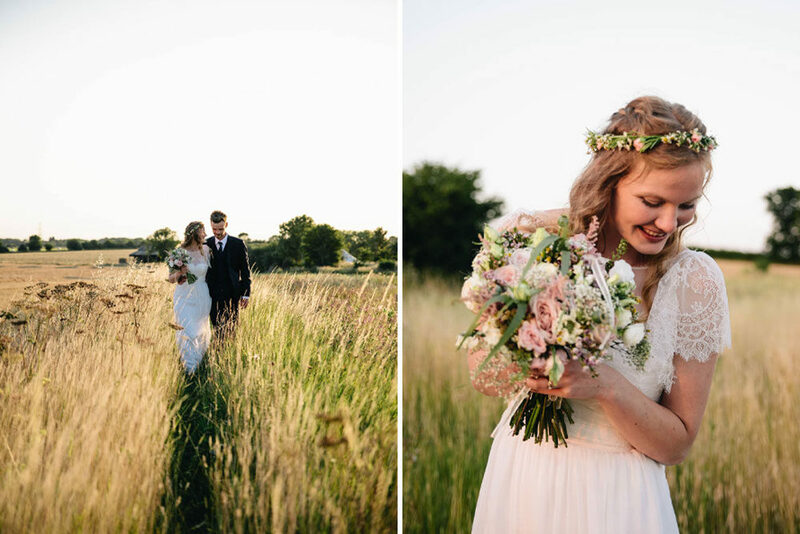 Childhood sweet heart’s Laura and Sam had a beautiful English, outdoor wedding that couldn’t have been more them! 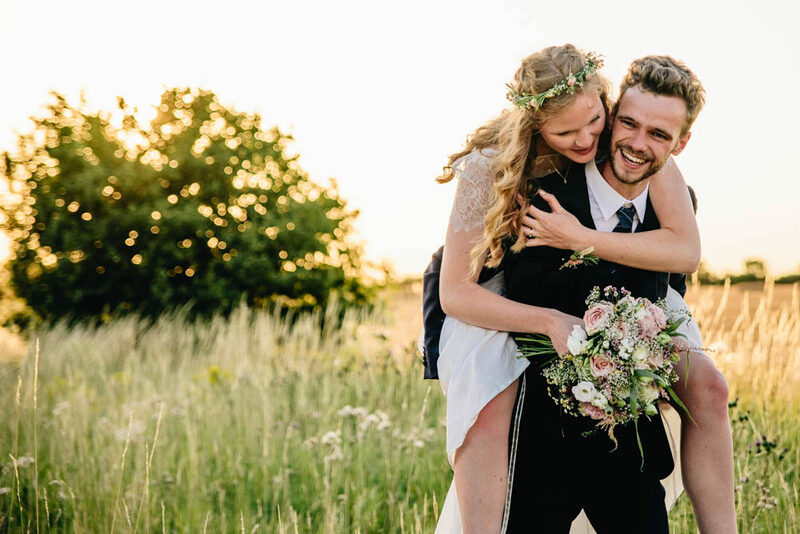 Every detail expressed their personalities and love for each other and their families. 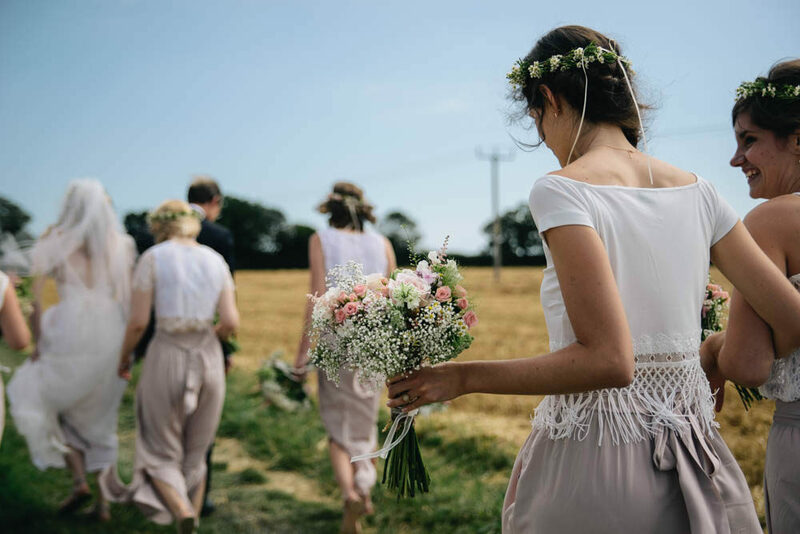 From the gorgeous bespoke dress Laura designed alongside dressmaker Lydia, to the hand tied bouquets and planting of an oak tree in Sam’s family garden instead of cutting a traditional wedding cake. Sam and Laura both got ready at their own family homes before making the walk across the wheat fields to the village church. The afternoon led into an evening packed with celebration. A jazz band on the back of a tractor trailer accompanied by Pimm’s in the sun before a buffet dinner created from recipes made by friends. The evening started with marshmallows and songs around the campfire before taking it up a notch with a barn dance and disco. 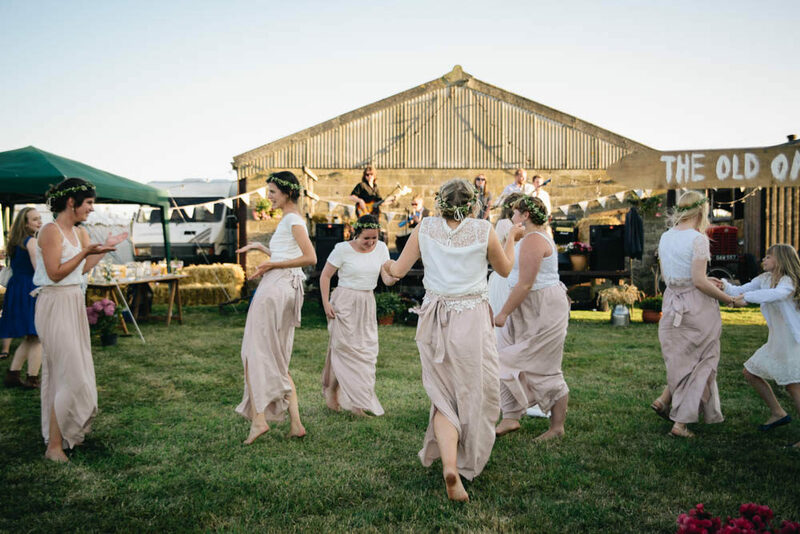 Claire Fleck Photography has captured all the homemade pretty, all the comradery and all the fun of this country wedding. Laura the Bride: I had a lot of fun trying on dresses but none of them were quite what I had in mind. So drawing inspiration from Laure de Sagazan and Grace Loves Lace, I designed my dress and the wonderful Lydia Payne made it for me who was a friend of my fiancé’s living in London. I wanted the dress to be slim line and flattering but also free and flowing. In the end this was achieved by making the inner silk lining hug my figure and the outer silk chiffon pleat from the waist. I spent four Saturdays watching chick flicks with Lydia and slowly seeing the dress come together. It was such a personal experience and Lydia even made me a nightdress from the material used on the waist belt. I found my perfect, delicate French lace in the Silk Society, London. The final touches to my dress were made 2 days before the wedding, which was a little stressful but meant I couldn’t scrutinise it too much and I’m so pleased with Lydia’s work. My fiancé was very good with knowing what he wanted and how he wanted the Ushers to look. He went for a sharp midnight blue Italian cut suit with a blue waistcoat and his Great Granddad’s tie. The tie he intended to wear went missing on the morning of the wedding! It was a dark green with a paisley pattern and pheasants on it. Sam also wore his wedding present watch from me. 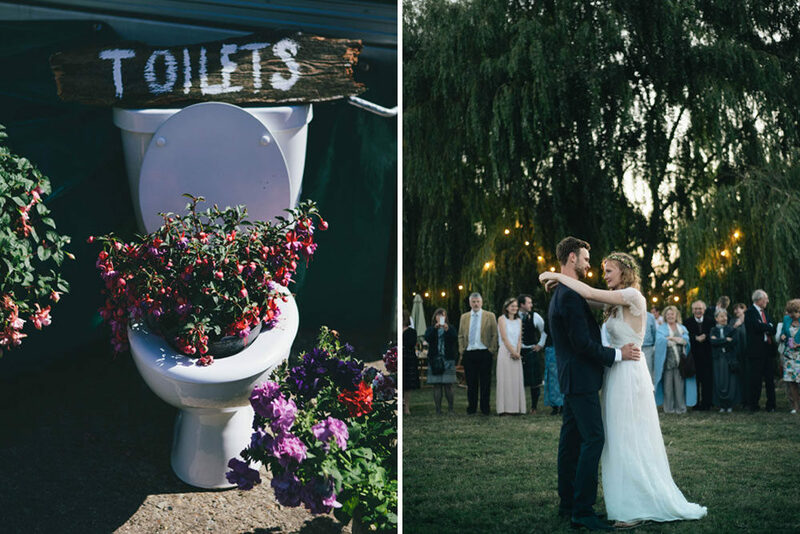 The venue came very naturally to us – we had it in Sam’s garden! He lives on a farm with surrounding corn fields so there was lots of space. I’ve been best of friends with Sam for 7 years and so it was wonderful to have the reception in a place that had so many memories for us already. It also meant that we had free licence to do as we liked. We hired a big marquee with cream canvas and wooden poles from County Marquees who were brilliant. Our colour scheme was pretty haphazard. We had more of a ‘feel’ in mind than a colour scheme. 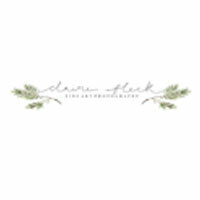 Fresh, free, natural, personal, rustic and handmade was our ‘feel’ and it resulted in light summery pastels, browns, creams, dark blues, candles and lots of personal touches and family and friends involvement. We had a unique approach to the bouquet flowers in that to Sam’s Grandma’s concern I wanted to make the bouquets with my Bridesmaids the day before the wedding. I love flowers and I didn’t want a florist doing the best bit! So after a lovely local florist called Naomi Wiffen from Rose and Berry gave us a flower making workshop with lots of tea and chocolate, the Bridesmaids and I put together our own organic and natural bouquets made up of Pale pink astilbe, red rubus (unripe raspberries), pale pink spray rose, Lisianthus, Gypsophila, cosmos, poppy heads and lots of daisies and foliage. 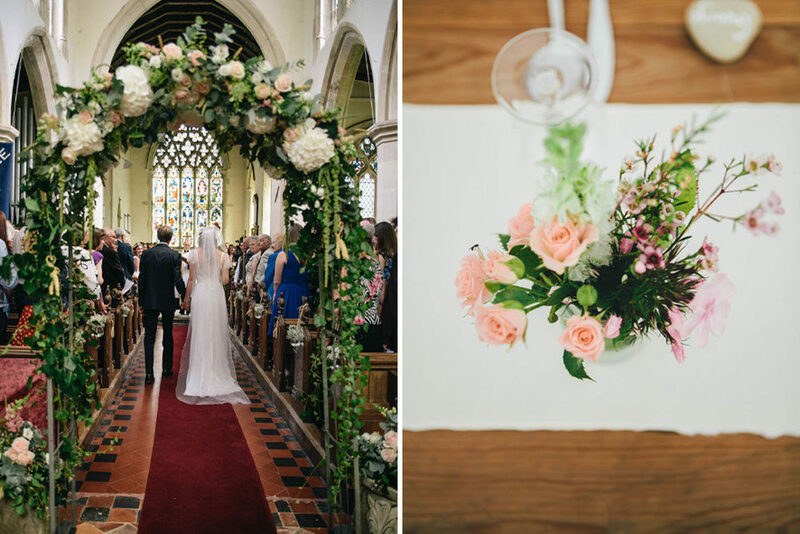 We filled the marquee with the same flowers and lined the church aisle with white Gypsophila. 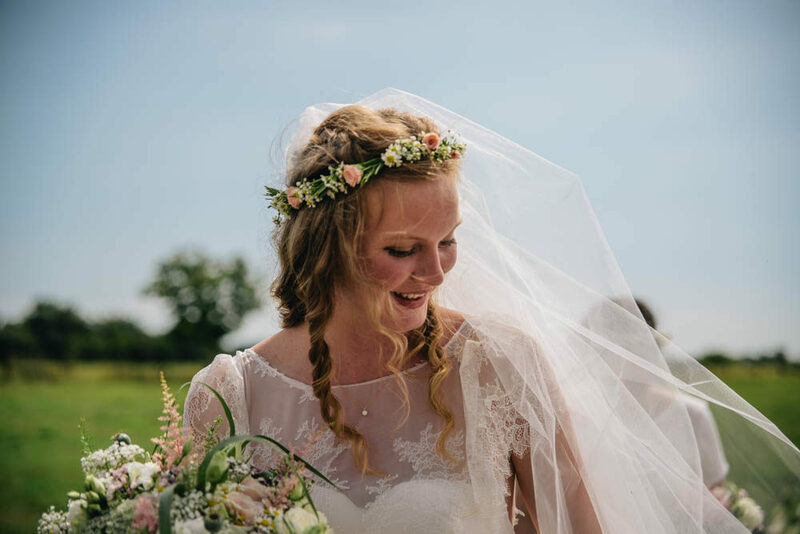 Naomi, our wonderful florist and inspiration for our flowers skilfully made the buttonholes, beautiful flower crowns and a huge flower arch in the church. I was told it would be impossible for me to do all of that myself! Our tables were lovely exposed wood trestles from the local village halls. My Sister made some cream calico table runners and we displayed flowers and pots of herbs on the tables. We also had a ‘how well do you know Laura and Sam’ quiz to get people talking on the tables. I live by the sea and during the weeks before the wedding we collected 150 stones and made them into table name places. Our wedding favours were envelopes of seeds. My Bridesmaids wore high-waisted, pale pink, pocketed cotton maxi skirts from New Look. We got them for a bargain price and I asked the Bridesmaids to source their own white lacy top, jewellery and shoes. Complete with their bohemian flower crowns they looked very free and summery; exactly what I had in mind. My little flower girl (Sam’s cousin) wore a white lacy dress and all eight of them were quite something to behold. The Ushers wore light chinos, Zara Man, brown waistcoats, ASOS and their own brown shoes. Their bow ties were navy to match Sam’s suit. We wanted them to look authentic and farmery so a few of them wore farmer caps too! They looked great and it was a good choice not to buy jackets, as it was a hot summer’s day. Sam and I met when we were 16 and we’ve shared a growing Christian faith since then, and so it was an obvious decision to have the ceremony in a church. Stonham Aspal Church is opposite Sam’s primary school and back at 16 when were awkward but fond friends we would regularly make the walk across the fields in our wellies to this church. 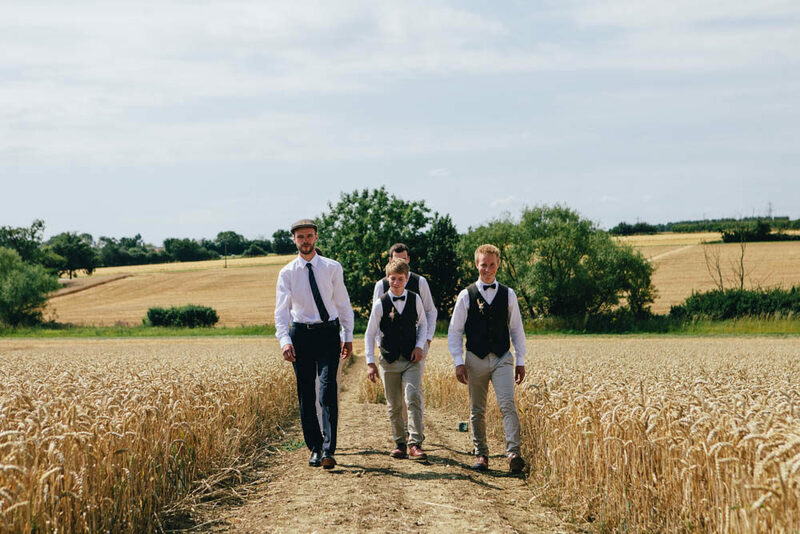 With the farm being two fields from the church we wanted our guests to walk with us across the fields and thanks to the weather it turned out to be one of the most memorable parts of the day. My family is very musical and it was lovely to include them in the ceremony. My Auntie and Cousin played cello duets whilst the guests were arriving and my Brother’s played and sang my entrance song and one of my Bridesmaids, Jessica joined them once she’d walked up the aisle. My Sister read a poem that Sam and I co-wrote which was a special moment and my whole immediate family (I’m one of 7) played a jaunty childhood gigue called Marie’s wedding whilst we signed the register. The ceremony was so joyful and it was amazing to have everyone there smiling back at us. When the guests arrived at the farm they were given Pimms, homemade sloe gin or cider. The wedding breakfast was a sumptuous Mediterranean array of baked Camembert, cold meats, grapes, salads, artisan breads and our favourite Barefoot Shiraz. Local village friends made the puddings and Sam’s relative provided the hog roast in the evening. We wanted a relaxed feel after the wedding breakfast; we set out football goals, boomerangs and a trampoline. Sure enough a spontaneous and energetic football match took place between Ushers, guests, children and the Groom himself. A five piece jazz band led by my Brother and friends played tunes throughout the afternoon. As the sun got low in the sky, guests gathered for some campfire singing and toasted marshmallow led by my vivacious Auntie; a long standing tradition in my family. After my Husband and I had planted an Oak tree (instead of cake cutting) and had our first dance, the Ceilidh kicked off outside, in front of the marquee. We had beautiful outdoor vintage light bulbs strung through the willow trees. The atmosphere was something special and between Ceilidh sets the older people kept close to the bonfire and everyone else let their inhibitions go and danced the night away. It was so much fun and such a special start to our marriage. When we were about to leave everyone gathered for a last dance and we left the happy throng through a tunnel of lighters!